Life is a grind in the sense that the best grinders are very successful. I’ve written about golf before. It’s a game I love to play. As I’ve gotten older I’ve kind of fallen in love with it more and more. It seems there is always something to learn and I hope that never stops. A few weeks ago I finished reading, It’s Only A Game by Jackie Burke Jr. Mr. Burke shares his thoughts on life and golf in the book. It’s simple, but has profound insight into both. One little nugget is that yesterday is a million years ago. Mr. Burke realized in his career as a professional tour golfer that it could be difficult to shoot a good score one day and another good score the next day. He looks at the word “recreation” coming from the word “recreate”. It means that every day with golf you have to recreate your game or score from scratch. You can bring your skills, but the elements will be different. The pin locations will be different. And you’ll be a little different – your body and mind. 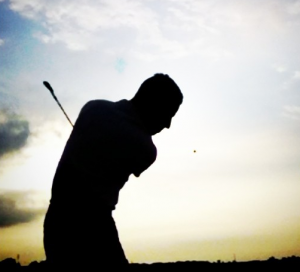 In golf, it’s easy when you’re swinging free and really feeling it. Most shots are going well. Putts are falling. The bounces are going your way. Golf is fun and easy when that’s happening and every golfer that loves it practices for those kinds of days. But the reality, even for the pros, is that those days don’t happen often. They obviously happen more often for pros, but the real trick the best pros understand is how to get the most out of their bad days or when times are tough. Tiger Woods was one of the best grinders of all time. He first came out on the PGA Tour and caught some flack for saying that he won a tournament without his best game. That irked some of the veterans of the tour, but Tiger was being honest. He knew how to get the most of of his game even when he wasn’t playing his best. And he did that for his entire career. It was almost like Tiger relished the challenging times more than the easy times. Not many people are wired that way. The word on the Tour for that type of player is “grinder”. Players are grinders when they get the most out of their game all the time. They grind through the tough times and before people realize it those players are making cuts, making top tens and even winning. The much more common situation is for a player to be streaky. When things are going well they’ll win every time. But when things are bad they kind of check out and wait until things start clicking again. I’m not a fan of the word “grind”. It makes it seem like life is never enjoyable. But as we could observe from Tiger, he kind of liked when times were a grind. He got satisfaction from turning a potentially bad day into a pretty good day. He knew that if he could do that he would be in position to win especially if his game came back the next round. Life and golf have many parallels and I think this is one. The most successful people in life seem to often be the ones that know how to make it work when things aren’t going good. Maybe it’s a business that is struggling to get new customers, but they can maybe pinch a few pennies, lean on savings and keep things chugging along until things get back on track. Anybody can run a business when the sales are rolling in and things are on auto-pilot. But the reality is that every business and everybody goes through challenging times. Let’s say a business loses a big client. That’s like hitting a drive in the water in golf. Okay. It happened. It’s time to move on and figure out how to salvage things. In golf, the best players still hit it in the water sometimes, but they’ll take their penalty drop and give themselves a chance for a par and at worst a bogey. They will concede a little, but they won’t get crazy and turn a bad situation into a deadly situation (like a triple bogey). If you lose a client, take a step back and assess the situation. Don’t overreact by getting angry or panicked. Look for a way to salvage the situation. Maybe you can get the client to do some lesser business for a few months. Or maybe you can figure out how to move around resources so you can provide more services to another client. Maybe it’ll take some extra work to meet the month’s quota by doing some cold calling and knocking on doors. The next time you’re watching golf pay attention to the players near the leaderboard. Chances are they’re not hitting every shot perfect. They’re certainly hitting great shots, but they’re also hitting bad ones. And when they hit those bad ones watch how they grind things out to salvage a score that keeps them in contention. At the bottom of the leaderboard you’ll find the players that get into trouble too often and that struggle with the grind. That parallels closely with many aspects of life. Times aren’t always good, but if you can figure out how to make it work when you’re not at the top of your game you’ll find success more often than your peers.